Unbeaten welterweight contender Roberto Arriaza (17-0, 13 KOs) smoothly out boxed Juan Ruiz (20-2, 12 KOs) through 10-rounds Friday night from the Doubletree Hotel in Ontario, Calif.
With the unanimous decision win, the 27-year-old Nicaraguan successfully defended his WBO Intercontinental Championship. Arriaza, ranked No. 9 by the WBO, controlled the fight right from the jump. He backed up the lanky Ruiz with strong rights and timely body punching. Ruiz fought tentatively from the outside and appeared to employ an almost too cautious game plan. 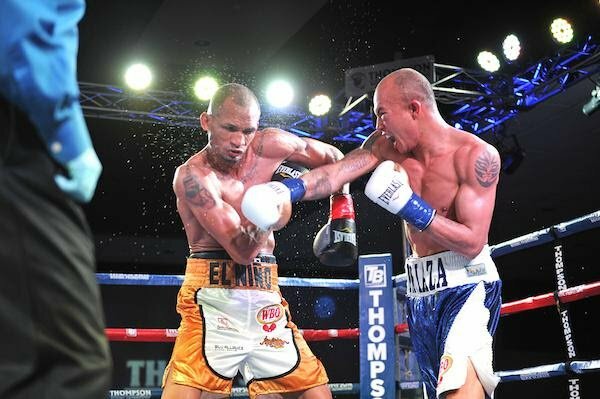 Arriaza shined in the marquee fight of Thompson Boxing’s 18 year anniversary show. He showed all the makings of a legitimate contender. He worked off an accurate jab, consistently landed power shots, and walked through most of what Ruiz was throwing. The “Path to Glory” co-feature between featherweights Erick Ituarte (20-1-1, 3 KOs) and Carlos Carlson (21-4, 12 KOs) packed tremendous excitement and intrigue. Ituarte won by close unanimous decision, and thus, retained his Junior NABF championship, but it was not a cake walk. Carlson, a former world title challenger at bantamweight, came to fight and brushed back Ituarte with heavy shots periodically through the 8-round fight. Ituarte, however, was more consistent in his attack and was able to sway the judge’s minds by landing flurries in virtually every round. The fourth featured numerous heated exchanges that brought the sold-out crowd to its feet. Ituarte found his groove in the middle of the round, while Carlson countered toward the end in an attempt to steal the points. Ituarte, however, had too much firepower for the smaller Carlson. The Santa Ana, Calif. native won with scores: 78-74, 77-75 twice. Top junior lightweight prospect Michael Dutchover (9-0, 6 KOs) of Midland, Tex. continues to improve on his advanced skill set. He knocked out Mike Fowler (6-15, 2 KOs) in the third round (1:19) after landing consecutive body shots that sapped the air out of Fowler’s lungs. Dutchover proved his talent early by connecting with body shots in the second round that floored the shorter Fowler. Dutchover, 20, rarely got hit and displayed superior hand speed and excellent instincts. Dutchover is trained and managed by Danny Zamora and promoted by Thompson Boxing and Banner Promotions. Undefeated bantamweight prospect Mario Hernandez (6-0, 3 KOs) used his signature pressure to stop Neri Garcia (1-5) in the third round (2:26). Hernandez fought off his front foot for the entire fight, carefully stalking and pouncing on the overmatched Garcia. The Santa Ana native punched Garcia onto the ropes and corners numerous times, often connecting solidly with body shots. Toward the end of the third round, Hernandez landed a series of combinations, which caused referee Raul Caiz, Jr. to end the fight at the 2:26 mark. Elite lightweight prospect Ruben Torres (5-0, 5 KOs) of Los Angeles made it five straight knockout wins to start his career when he delivered a brutal, third round stoppage (2:15) of Sergio Gonzalez in the “Path to Glory” show opener. Torres dropped Gonzalez at the end of the first round with a strong combination. The second round featured a more tactical approach by Torres, but in the third, he opened up and punished Gonzalez for his weak guard. He landed upstairs with a right hook, which sent Gonzalez face first to the canvas. That spelled defeat for Gonzalez, who remains winless at 0-2. “Path to Glory” was presented by Thompson Boxing Promotions and sponsored by Everlast.